But for Aguilar—Pandora’s senior director of compensation and benefits—the zeal is about more than motivational quotes and corporate buzzwords. It’s about something deeper, something personal. After his father’s sudden death when he was very young, Aguilar’s mother raised him and his two sisters on her own. Childhood in Southern California as part of a poor, bilingual family came with barriers and challenges. On top of that, one of his sisters died in a car accident, and then his mother of cancer. Those beliefs drive Aguilar both in his life and as a leader at Pandora, where he creates, implements, and maintains a host of company-wide employee compensation and benefits programs. He joined the organization in 2013 for the chance to develop a team and set strategy at a rapidly growing company. Then, Pandora had 800 employees. Today, the Oakland, California-based Internet radio service has more than 2,200. 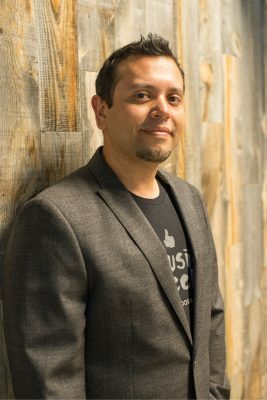 To align his department with the business and meet the needs of a growing organization, Aguilar crafted and remained open to growing and evolving his original vision over time. He draws best practices from various industries including biotech, semiconductors, and entertainment. “Working in many industries has given me a broad view of what works in certain situations, and I’ve catered an approach specific to where Pandora is and where the company wants to go,” he explains. Aguilar’s biggest takeway is that compensation and benefits leaders must allow for flexibility. “We have to trust our managers and empower them to make decisions.” Unlike other leading companies, Pandora doesn’t use annual performance ratings to award merit-based salary increases. The company that provides personalized radio is dedicated to reaching a large audience and making a real difference. “There’s a lot of soul to what we do,” Aguilar says. Pandora was born in Oakland, remains housed in Oakland, and is dedicated to supporting the local community. Aguilar’s compensation and rewards programs reflect that value. Pandora doesn’t provide some of the flashy perks that other tech companies might provide—but for surprising reasons. “For example, we don’t have a cafeteria because we want our employees to go out and support local businesses and give back to the community,” he says. Pandora’s leaders want every teammate to establish strong relationships outside of the workplace in their communities. Pandora attracts top talent by staying true to its principles, paying competitively, and offering unique opportunities. Engineers and others at the relatively small company have the chance to increase their skill sets and make meaningful and lasting contributions. In 2015, Aguilar’s team introduced a new leave-of-absence policy giving all leave categories the same benefit. Now, everyone facing a leave of any kind receives twelve weeks. They also added new LGBTQ benefits, like providing health and other benefits to employees’ domestic partners. As Pandora grows, Aguilar will make sure his team is built to support these activities. He’s surrounded himself with driven self-starters who share his passion—and the results are there. Together, Pandora’s small compensation and benefits team is outperforming its larger counterparts as they build the foundation for ongoing success. What are your favorite Pandora stations? Some of my favorite stations are Tool, Thrice, Al Green, CHVRCHES, and the NPR podcasts like Serial. Have your music habits changed since working at Pandora? Oh, for sure. One of the great things about Pandora is that it encourages each user to discover music. You hear new songs and new artists. I’ve discovered that I really like electronic dance music. I didn’t know that before. Working here has opened my eyes to new artists and new genres. Can you share any secret Pandora hacks or features? It’s not much of a hack but right now, I’m using Thumbprint Radio. Thumbprint takes everything that you’ve given a thumbs up to and builds a station off of that information. So, essentially, whatever you’ve liked becomes the foundation for your new playlist. Pandora adds new songs to it, and the list changes and grows every time you give a new track the thumbs up.